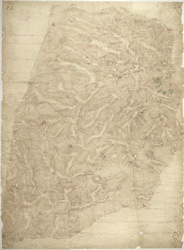 Light brushwork interlining ('hachuring')is used to represent the gently undulating clay vales and ridges that make up much of the area covered by this drawing. Enclosed farmland dominates the landscape. There are only small areas of woodland, indicated by dark green washes. Leicester is shown at middle left along the Fosse Way, the Roman road from Exeter to Lincoln, via Bath, Cirencester, and Leicester.